At 1am, it threatened to rain just after the emcee had announced the long-awaited fight between Moses Golola and Ronald Mugula was next. This, however, did not make the star-studded audience budge. 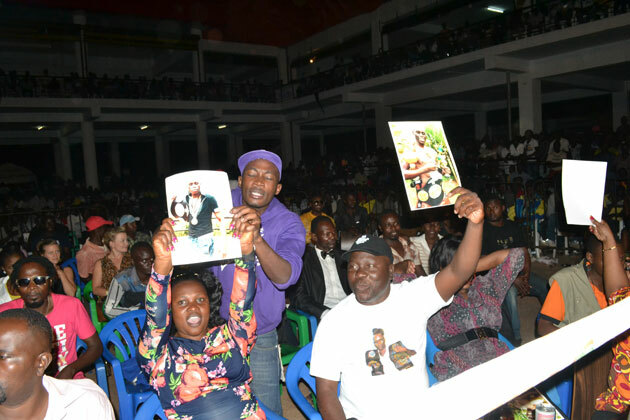 Mugula’s lead morale booster, singer Mesach Ssemakula, was busy distributing posters of his man to fans, while Geoffrey Kayemba Solo, singer Chris Evans’ manager, and DJ Messe were busy distributing Golola’s posters. This brought heartiness to the Friday show that had Meddie Ssentongo, Sulaiman Ssekamatte, Ssalongo Kasawuli ‘Samona’, Sarah Kabenge, Charles Bukenya Muvawala, Suudi Lukwago, Ragga Dee, Titus Tugume, DJ Michael and Aziz Azion, occupy ringside seats. Mugula, whose role model is Jean Claude Van Damme, was ushered in by singer Dr Hilderman. He looked relaxed as the audience shouted his name. He was soon joined by Golola dancing to Gravity Omutujju’s Winner. Early on, Dr Hilderman, Gravity Omutujju, Chris Wajadi and Denzo had entertained the fully-packed Freedom City arena. This was followed by a series of curtain-raising fights that kept the audience glued to their seats for over seven hours, feasting on beers and snacks. By the end of the fight, Golola’s fans were the only people remaining in the arena as Mugula’s beat a hasty exit after their man was taught a lesson he will never forget, as he came crumbling down. “Let’s take the results as they are,” said Mugula as he accepted defeat. “I promised to beat him with a zigzag style and I did that. If it had failed, I was going to beat him in a Ugandan way,” said Golola after being announced winner. Coached by former boxer Zebra Ssenyange, Golola won new fans given his speed and courage. At every end of a round, he entertained his fans with a dance. People left the arena at 2am contented. Despite the downpour, they looked unbothered as they huddled groups discussing the way Golola thumped Mugula. “Let’s take his wife as you promised,” fans shouted, reminding Golola he had promised to take Mugula’s wife if he won.